The iconic rivers of Washington's Olympic Peninsula loom large in the minds of fly anglers worldwide. Names like the Hoh, Bogachiel, Sol Duc, and Queets haunt the thoughts and imaginations of steelhead die-hards, evoking images of moss covered rain forests, tumbling coastal rivers, and chrome bright steelhead, fresh from the salt. The rivers of the Olympic Peninsula are perfectly suited for swinging flies and offer some of the greatest winter steelheading opportunities in the Pacific Northwest. Originating high in the Olympic Mountains, these legendary rivers flow through lush temperate rain forest before entering into the Pacific Ocean. 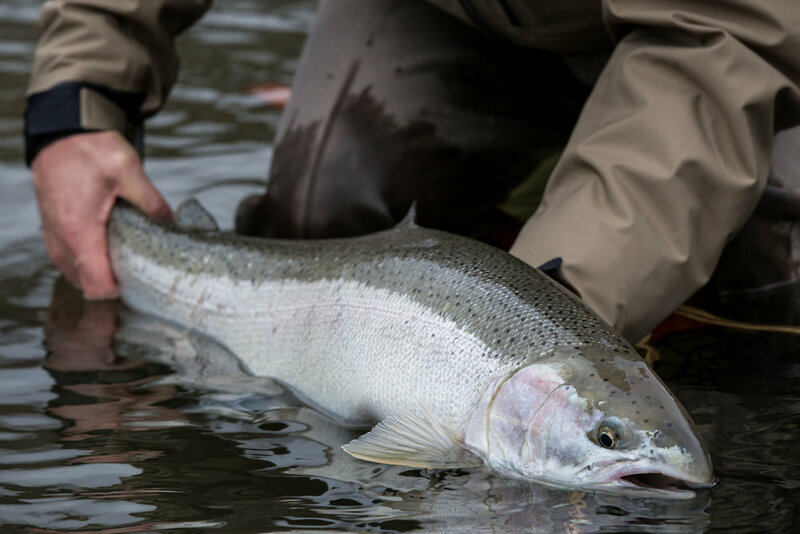 During the months of January through April, the rivers of the Olympic Peninsula host one of the world's largest runs of wild winter steelhead. It is these fish that have put this soggy serene corner of the country on the fly fishing map. While this is not a place to come to "pad the stats", the tug of a wild Olympic Peninsula steelhead can be nothing short of life altering. Location: Forks, WA serves as the launching off point for all of our Olympic Peninsula guided steelhead trips. Your guide will meet you each morning directly at your lodging or at a central meeting location in the town of Forks. Rivers: We fish all of the major Olympic Peninsula Rivers. These include the Hoh, Bogachiel, Sol Duc, Calawah, and Queets. The determination of which river we fish on a particular day depends on river conditions. Each of these rivers respond differently to varying amounts of precipitation, making one of them the best choice on a given day. Although complete blowouts do occur, they are relatively rare due to the diversity of rivers available to us around the Forks area. Please let us know if you have a preference of which river you would like to fish. Fishing Method: We use drift boats/rafts to float the rivers, getting out at productive runs and wade fishing. While we use the boat to provide unlimited access to the best runs on the river, all fishing is done while wading using spey rods and swung fly techniques. We are passionate about pursuing steelhead by using spey rods to swing flies. Our guides are exceptional spey casting instructors and pride themselves on making sure that you become a more proficient spey caster throughout the course of the day. New to spey? Not a problem, we love working with people who are new to spey casting or new to fly fishing entirely. Spey casting is not hard, it just takes the will to learn and a good instructor. Recommended Equipment: **If this is foreign to you, read no further, we've got you covered. ** Spey rods, Skagit heads, sink tips, and big flies are the name of the game on the OP. Our preference is for 7-8wt spey rods in the 11'6" - 13'6" length range. Skagit heads are the best line choice for delivering the heavy tips and big flies that these rivers often necessitate. You will want a good assortment of sink tips ranging from T-7 to T-14. Winter steelhead intruder-style and tube flies in blacks, blues, purples, pinks, and oranges are always a good choice. We are happy to provide all equipment free of charge on all trips. A more detailed packing list will be provided at the time of booking. Included: Approximately 8 hours of guided fishing, deluxe shore lunch, non-alcoholic beverages, all equipment (including spey rod/reel, waders, boots, flies, leader), and shuttle (you may be asked to assist with shuttle logistics depending on the stretch of river that we are floating). Cancellation Policy: Cancellations within 30 days of trip date will result in a forfeiture of deposit if a reschedule date cannot be agreed upon. Cancellations by the guide due to weather, river conditions, or other circumstances will be refunded in full or rescheduled with no penalty. Cancellations due to river conditions or weather are exclusively at the guide's discrection.